Even though there are millions of Americans who suffer broken bones every year, broken bones become far more dangerous when they happen to older people. While sometimes broken bones in nursing homes cannot not be prevented, oftentimes nursing home staff inexperience or negligence may lead to serious injuries to residents, sometimes even in death. According to CDC research, every year 1,800 elderly Americans die in nursing homes because of falls or fall-related injuries. As the number of elderly is only going to increase in the coming decade, the problem is going to continue to develop until we enforce stricter, preventative measures. The Nursing Home Law Center LLC represents individuals and families in cases involving fractured bones. If your family member sustained a broken bone during an admission to a nursing home, contact us today for a free case review with an experienced nursing home attorney. Traumatic fractures – The cause of these bone breaks are typically injury. In older Americans, it can happen because of a simple fall that would not have been a problem years ago. As people age, their coordination skills tend to decrease. This means that older adults are more susceptible to falls. Compression fractures – These are also known as a spontaneous fracture. This will happen randomly without there being a direct incident. People with frail bones and osteoporosis may experience compression fractures. Even just walking may lead to a broken bone for those who are at risk for compression fractures. Stress fracture – These are small cracks in the bone, usually caused by a repetitive motion. The common locations for these stress fractures are the lower parts of the legs and feet. 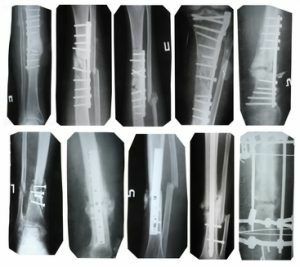 While staff members at a nursing facility may not be directly responsible for these types of broken bones, they are responsible for assisting in medical check-ups and monitoring patients. If the stress fracture is not treated, it will likely increase the cracks in the bone over time. This leads to swelling and intense pain. Even though the elderly are at a far greater risk for falls, it is important that we remember that nursing homes have a responsibility when it comes to minimizing possible risks. Oftentimes it would have been possible to prevent fall-related injuries if the nursing home staff took proper precautions or had been paying closer attention to the residents. Sometimes the problem is related to negligence, other times it has to do with understaffing or improperly trained staff members. The nursing home may be liable if a resident falls and suffers broken bones or other injuries. Other instances of the nursing home being held liable include excessive use of physical restraints, physical abuse by another resident or a staff member, or not providing proper safety equipment. If someone close to you suffers broken bones because of malpractice, abuse, or neglect by nursing home staff, it is important to take action. This is not merely about paying for incurred medical bills or recovering from pain and suffering. It is about making people aware of a problem in that particular nursing home. In speaking out and taking action, you can help keep other patients safe in the future. Many nursing homes will go to great lengths to explain how a fracture many occurred to an elderly patient– all without fault of the facility. Given that many broken bones are painful and require surgery or other invasive procedures, we strongly feel that every instance a patient sustains a broken bone in a nursing home merits an investigation by an attorney with experience handling these cases. Our nursing home abuse attorneys have successfully recovered compensation for nursing home patients who may sustain fractures due to falls, being dropped by staff, physical abuse or even unexplained circumstances. Contact Nursing Home Law Center LLC today to learn more about our practice and about how we can help in your particular situation.